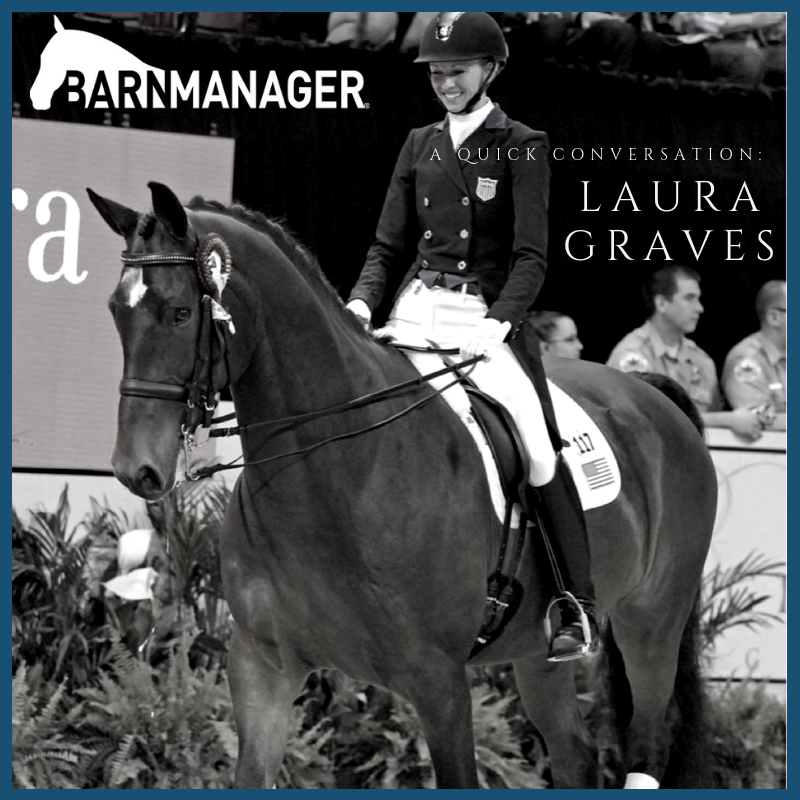 Each month, the BarnManager team is sitting down with accomplished riders from across equestrian disciplines to learn more about how they got their start, their typical days, their biggest advice, and more! We’re asking the same five questions and sharing their answers with you! Dressage rider Laura Graves is fresh off an incredible individual silver medal win at the 2018 FEI World Equestrian Games™ in Tryon (which she adds to her 2016 Rio Olympic team bronze medal), and we had the privilege of catching up with her before WEG at the BarnManager-sponsored “Dressage for Jumping” clinic! (Read more about that here.) She took the time to talk to us about everything from her 4-H beginnings to the hardest part of making your career out of riding. Q: What was the first horse or pony that got you started? There were actually two of them. My parents ended up trading our old, used washer and dryer for these two ponies. One of them was jet black, really handsome, and some sort of cob mix. His name was Rafter. Then we had a little Appaloosa whose name was Spanky. It started out with just those two, but then you know, you have a barn, and you have property – I don’t think my dad really understood that then my mom would just start collecting horses! Anything free or if it didn’t have a home or if it had some sort of tough situation needing rehabbing – there were a lot of horses that had mental issues. They were either really nervous or they wouldn’t get on trailers or for some reason or another people didn’t want them. So, we ended up with all of these free horses. I have two sisters, and we were all members of our local 4-H club and my mom ended up being one of the leaders. I just wanted to be a part of the presenting of the horses. I didn’t even want to ride. I just liked to groom them and present them. They judge you on how clean your tack is and your own turnout. Then it wasn’t until years and years later that I decided that I really wanted to ride. The other 4-H leader would give me some lessons. It didn’t really turn into dressage until that 4-H leader said, “You know, if she really wants to ride, she needs to get some real lessons,” and sent us on to a woman who also taught lower level eventing but focused mostly on dressage. 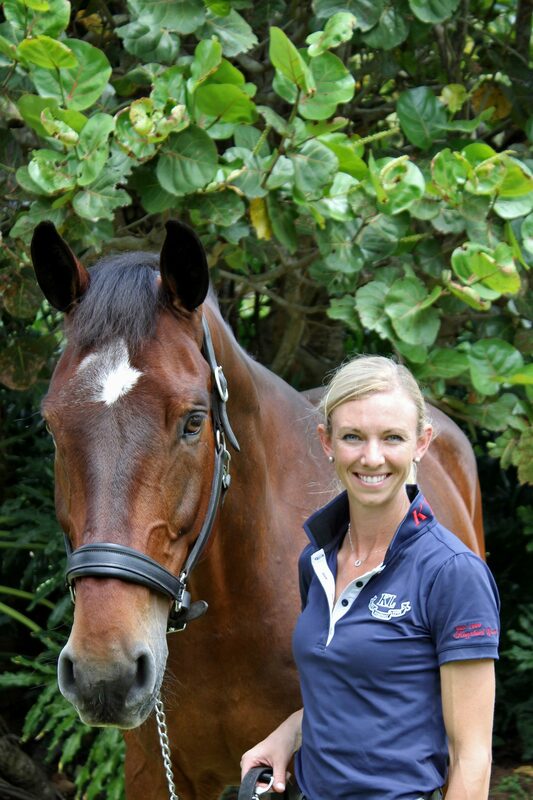 Q: You’ve had a lot of incredible success, but what’s your favorite riding moment or memory? I have probably two stand-out moments. 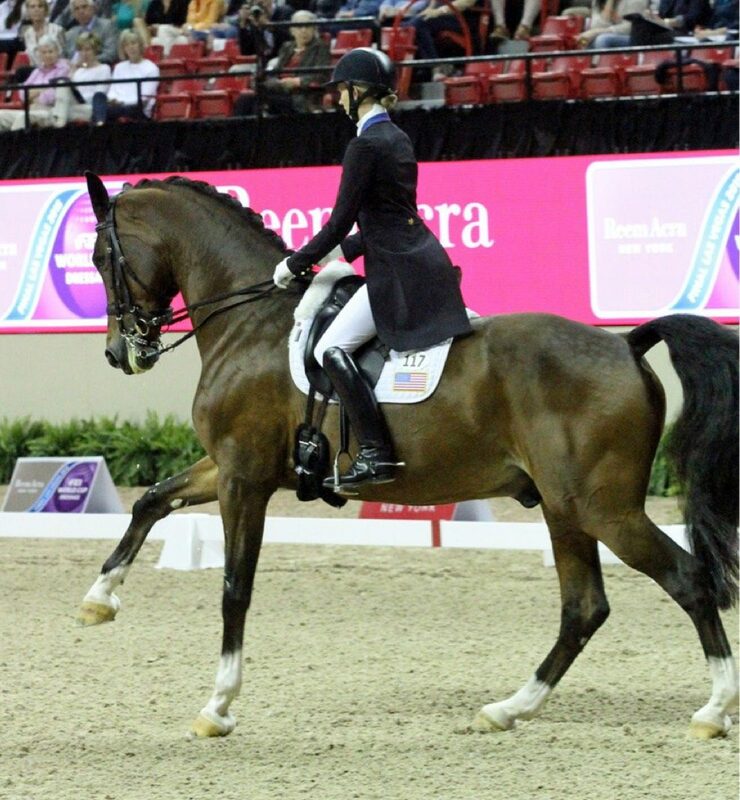 One was the [FEI World Cup Dressage Final] in Omaha. We had tweaked my final centerline for my freestyle a little bit. I remember the crowd cheering so loud that I couldn’t even hear when my music was supposed to stop. That was pretty amazing. In Rio, I was thinking, “We just delivered the ride of our lives!” and it was like crickets. I heard maybe four people clapping. I was so confused. But I said, “Good boy. I think you were pretty good.’”And then when we turned around to leave the stadium, my three teammates came rushing down because they could see the score, and they knew that we had just won the bronze medal! That moment was amazing. Q: What’s your number one goal right now? Q: On a typical day at home, what’s your schedule? I’m not a morning person. If I don’t have any wrenches thrown in, which is unusual, I get up around 7 a.m. I try to get the dogs out of bed – that’s usually the hardest part of my morning. They like to sleep in also. I’m always at the barn and on a horse by 8 a.m. Then I schedule my day so that the girls and I are getting barn chores done and horses turned out, and we just go through the riding schedule. Maybe I ride five or six in the morning, and then after lunch, it’s just teaching. I have three clients that have horses in the barn or trailer in. Then the horses are all done by 4 p.m. The barn is totally closed up, tucked in, lights off by 5 p.m. I just think the quiet time is so important for them. And if I can keep the part of their day where they’re being bothered shorter, I think all together they’re much happier. It’s something that I’m pretty strict about. Q: What’s one piece of advice you would give to young, up-and-coming riders? We fall in love with this sport for the horses, but when you decide to turn it into a serious career, you have to be really prepared to fail. I say nobody else cares that you take down a rail. Nobody else cares that you missed a flying change. And that sounds a little bit mean, but it really can be very isolating. Even the people around you, your parents or your spouse, they’ll say, “Oh I’m so sorry that you missed the flying change.” But nobody gets it the way that you do, and you have to be prepared to deal with that totally by yourself. I think that’s the hardest part of what we do.